One of Council of Asian Liberals and Democrats (CALD)’s important objectives is to strengthen its member parties by offering training. One field where this is of particular relevance is in the management and organization of political parties. Political parties are vital actors in any representative democracy, and the quality of parties affects the quality of democracy. In the young democracies of Asia, however, political parties are often relatively young too. They suffer both from internal weaknesses and a lack of support in improving their capabilities since many professionals shy away from politics. CALD therefore decided to fill the gap and offer its member parties a chance to learn together from their individual experiences. 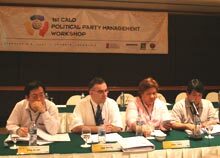 Together with the Friedrich Naumann Foundation (FNF), it sponsored a party management and development workshop in Jakarta, Indonesia from February 4-9, 2007. To provide an outside perspective, Paul Rowland of the National Democratic Institute of the US gave an overview of political party development in Asia. Stefan Kapferer, former head of campaigning ad strategy of the German Free Democratic Party (FDP), presented the management structure and organizational set-up of the FDP. He did this very effectively, brining out the underlying challenges that participants could relate to and compare to their own circumstances. All the participating parties presented salient features of their own organizational development and discussed them in the plenary. Participants also divided into working groups for several breakout sessions, discussing organizational structure and management functions, internal and external regulation of parties, internal decision-making, membership and grassroots organization. In the end, the participants came up with a list of suggestions for reforms. This list was subsequently submitted to the CALD Executive Committee, which adopted it as a benchmark to assess the future development of its members, and to better assist in the ongoing organizational development process.